I came across a great quote during the week, which has led to an unplanned continuation of our recent theme on self-deception. There are countless ways these two forms of self-deception could play out in the markets. But let’s look at one example of each. First… believing what isn’t so. 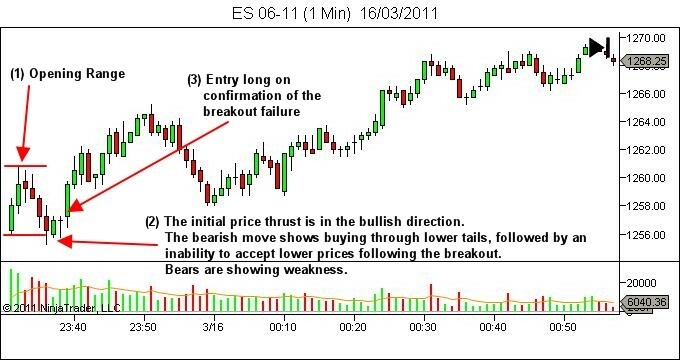 As an example of this form of self-deception we will consider the novice belief that a market gapping down should be sold (or gapping up should be bought) in order to profit from the continuation of overnight momentum. As the notes on the chart clearly point out, a simplistic approach to trading failed miserably in this case. The belief that you should “trade in the direction of a gap in order to profit from continuing momentum” just clearly did not help with your trading on this day. The trader was fooled by their own belief; believing what isn’t so. 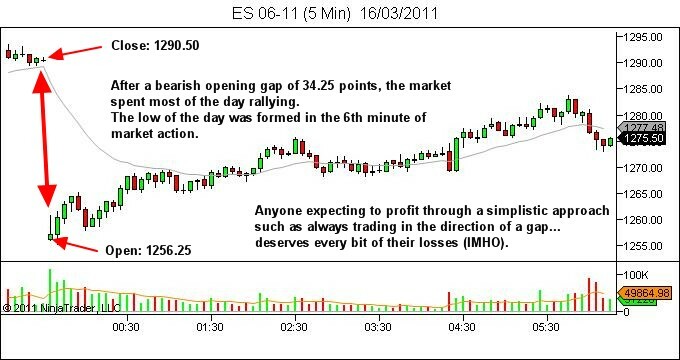 The one minute chart below shows a better way to approach this session, which positioned the trader long shortly after entry, into a lower-risk, higher-probability trade. Incidentally, the opposite belief is just as dangerous in my opinion; that an opening gap should be faded. Yes, it worked beautifully in this example. But it’s equally as dumb when the market does gap and go. Always anticipate the potential for self-deception. If you’re suffering a drawdown, is it possible that you’re actually suffering the first of Kierkegaard’s two ways to be fooled, and simply believing what isn’t so? Next week… refusing to believe what is so. By the way… if you are trading simplistic approaches to price action… consider maybe trying something different… like learning to trade. This statement was in your latest newsletter. I was wondering what you meant by it because from my understanding in the markets that many try to make trading way to complex. I trade price action (particularly vsa in combination of supply and demand areas i.e. I also love to pick tops and bottoms). I have a clear understanding of what moves the market and that is supply and demand / order flow. There are is no quantum physics involved. No mathematical formulas. Actually not much calculating at all. I know that there are other factors that go into trading-psychology, risk and trade management, documentation, back testing, etc. I guess I am just curious to know what you mean. I know I’m just playing with words here, but…don’t confuse simplistic with simple. I’ll refer you to an article by Dr Brett Steenbarger which will explain the difference between the two better than I can. Simplistic would be someone who simply buys at an MA cross and sells at the opposite one, simply in hope that a trend will develop, or someone who buys on an oversold signal in both of stochastics and RSI. Or someone who simply buys on a gap up, regardless of any other factors. Or who trades on emotion, entering long whenever surprised by a quick volatility expansion in the long direction. As Dr Steenbarger says, they’ve made a single observation and blown it up into a full hypothesis. Proper trading is not complex. As you suggested, the essence of it is quite simple. But it involves consideration of the context of the current market action and an assessment of the supply/demand dynamics. VSA is an excellent means of achieving this. As is my method, which looks at the markets more from the perspective of the other trader, rather than volume/price relationship, but usually finds trade opportunity in much the same places as VSA. No quantum physics or complex mathematical formula – just proper understanding of the nature of the markets, and analysis based upon that understanding, rather than just a single observation combined with hope, as most appear to trade. Let me know if it’s still not clear. My intent was certainly not to imply complexity is required. Far from it. Simplicity is required for successful trading. But not via a simplistic approach. Many thanks for your informative lessons! I really appreciate them!